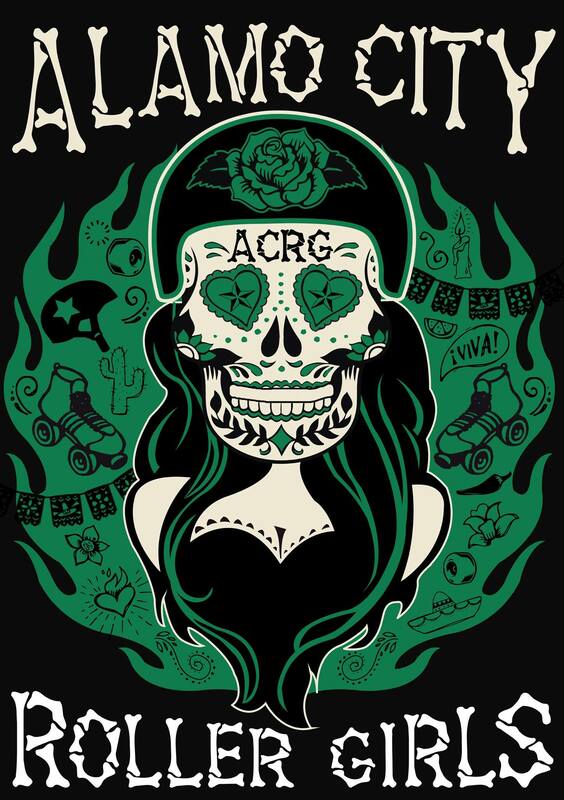 Rollin' News - World Wide Roller Derby News | March Bout Recap! Say goodbye to the regular season folks, next stop April and the Brewcity Bruisers Semi-Finals. But first let us all sit back and reflect, not only on the March bouts but all things great. As I sit here writing these recaps I am taken to a simpler time. It’s a Tuesday night, I’m in pajama pants before 7pm, I’m having a nice beverage (hint to potential sponsors, this could be you mentioned here!!! ), and I’m watching the great Teen TV Drama, Glee. Heck if you changed the show to Dawson’s Creek tonight could be confused for 2000 all over again. But I digress. Or do I? The adage, “The more things change, the more they stay the same” should never be discounted. With the March Bout Day (trying saying this as a camel, its way funnier) now behind us, let’s see how the action went. First up we had the battle of the two teams that have tasted both the sweet, sweet taste of victory and the agony of defeat. Disclaimer: This recap and any other recaps written by this author is in no way affiliated with ABC’s Wide World of Sports or the poor ski jumping guy who bites it hard in the opening video. The Shevil Knevils and Maiden Milwaukee were both hoping for the Big W, to end the regular season on a high note, and then carry that momentum with them into the Semi-Finals. Had this game been played under the newly released WFTDA rules set (look for those rules to come into effect for the Semi-Finals and Finals) the outcome may have been different, but on this night the old rules were still in place and the 1-minute penalties still reared their ugly heads. 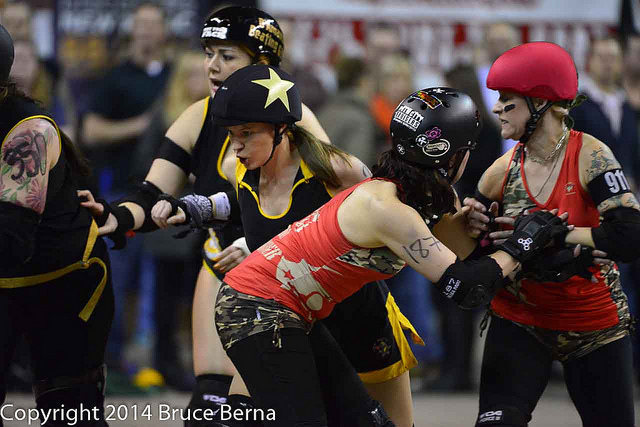 The action started fast and furious in this bout and the Maiden Jammers came to play. 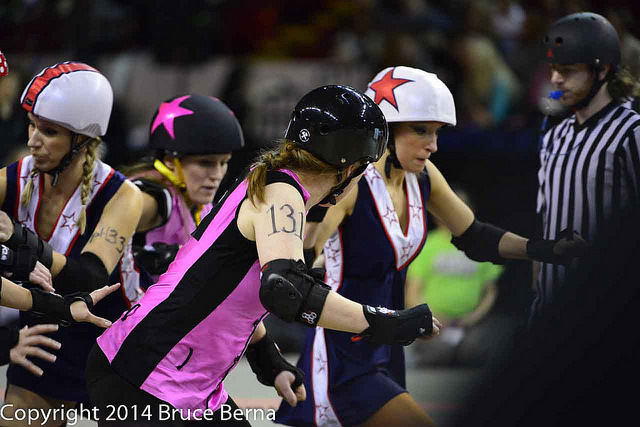 They took lead jammer on 8 of the first 12 jams, but they had one major problem. If we scored just 11 of those 12 jams they would have found themselves up 22-10 and looking pull away, unfortunately for Maiden fans all 12 jams count. A Jammer Penalty by Maidens Jammer Feisty Pfister opened the door for Shevils Jammer Skittle to score a 30-0 jam. So after 12 jams we were now looking at a 40-22 advantage for the Shevils. Sensing blood, the Shevils immediately took lead jammer in the next three jams, took advantage of another Jammer Penalty by the Maidens, and before anyone knew what happened it was 66-22 Shevils with just over 10 minutes remaining in the first half. The Maidens refused to give up and regrouped very quickly to pull back with a 17-0 jam led by Super Hera jamming and blockers Feisty Pfister, Bionika, Betty Clobber, and Rufpunzel holding back the Shevils jammer for well over a minute. Unfortunately for the Maidens they followed that up immediately with another Jammer Penalty and gave 13 of those hard fought points right back. The teams traded jabs after that to end the half and we saw the Shevils head to the locker room with a nice 92-64 lead. What was that I said about things staying the same??? New month, same crazy second half. If there is one thing we’ve learned so far this season it is to expect crazy things to happen in the second half. This bout would be no different. Shevils Jammer Skittle was called for a back block penalty right at the very end of the first jam and Super Hera, Thunderpants, Stormin’ DaCastle, and Frank Hurt’r took full advantage scoring 36 points and the Maidens took a 100-93 lead just 5 minutes into the second half. With the game truly hanging in the balance one team needed to step up and go out to own the next 25 minutes. On this night, that team was the Shevils. If a team has ever dominated a section of a bout the way the Shevils did the next 14 minutes, I have not seen it. The Shevils won lead jammer on 14 of the next 15 jams, held the Maidens to only 4 points in that span, and had 0 Jammer Penalties. Before the Maidens knew what hit them the score was 164-104 with about 9 minutes remaining. The Maidens controlled the final 9 minutes of the bout, but with the Shevils skating nearly penalty free the comeback was just not meant to be. When all was said and done the Shevils were celebrating a very hard fought 181-149 win. Next up we had those crazy ninjas of the Crazy Eights looking to complete a perfect regular season. They are the 3x defending champs, but a perfect regular season is something that has evaded them. This Bout Day (seriously say it as a camel) featured the last team to beat them and the team that ruined their perfect season last year, the 0-2 Rushin’ Rollettes. Would the Rollettes be able to put forth the Stakhanovite effort needed to unseat the defending champs and secure their first win of the season? The Eights came out of gates hot as usual and won 7 of the first 9 jams (believe it or not but that was their slowest start of the season) to quickly open up a 52-19 lead with 16 minutes left in the first half. As they have shown all season the Rollettes refused to go quietly and slowly began clawing their way back, actually closing the gap to 63-35 behind some great jams by Carrie A. Hacksaw and NBD. They seemed poised to take the momentum with them as we approached the last 10 minutes of the first half. Unfortunately an extended injury timeout brought the bout to a halt and meant the last 10 minutes would be disjoined from the first 20. After the break the Eights came out on fire, as has been the pattern all season. Lady Pulverizer, Zo-Tay, Latina Heat, and Sharkira won 5 of the last 7 jams, and took a 130-54 lead into the locker room. All the exciting action returns April 19th as the Brewcity Bruisers present the Semi-Finals with the winners advancing to the Championship. Our bouts will be a replay of March…will the results be any different? Can the Rollettes win their first bout of the season and prevent the Eights from their quest of a 4-peat and perfect season? Will the Maidens avenge their loss to the Shevils and book their ticket to the Championship? Or do the Shevils just have the Maidens number this year? Only one way to find out and that is to be there on the 19th. It will be playoff derby at its finest and dont forget, new WFTDA rules will be in play and the result should be just more of the intense derby action you’ve come to expect.